While this isn’t specifically about poetry, it’s a great story and a really neat place. Also, I’ll be reading at the Ryerss Museum as part of the Fox Chase Reading Series on February 24. Details here. Many who attend our Fox Chase Reading Series at Ryerss Museum and Library in Northeast Philadelphia are familiar with the story of how the Ryerss Burholme summer home became a museum and library and the grounds a large park for the enjoyment of the people. When touring the museum we learn of how the Ryerss were animal rights activists long before it became popular with stories of Anne Waln Ryerss saving abused horses and bringing them back to Burholme to care for them. Anne’s stepson, Robert Waln Ryerss, a Philadelphia attorney, was instrumental in helping create the Pennsylvania SPCA and the Anti-Vivisectionist Society of Pennsylvania. The Ryerss Museum and Library features a pet cemetery and many portraits that the family commissioned of their beloved animal companions. 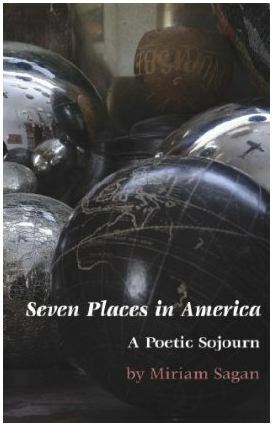 Frequently while reading Miriam Sagan’s latest poetry collection, Seven Places in America, I was struck with waves of jealousy. The book is constructed around her journeys and residencies at what, at least through her writing, must be some of the most wonderful places in the country for a poet to meditate on things great and small. This is especially true for a poet like Sagan, who has an affinity for the more rustic or natural places. 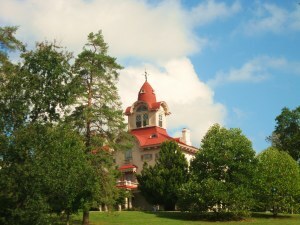 Some of these places were official writers’ retreats, while others were just places that accommodated her, and she accommodated them. Either way, she made the most of these visits, as good writers can, by using the foregrounds and backdrops as gateways for her poems to pass through or stretch out within. Her poems ride “the boat of the mind/that floats on air” tacking through waterways looking for purchase. When they land on hard ground, you know it, as in “10,000 Islands,” part of a series titled Ever/Glade (which, incidentally, made me think of Karen Russell’s novel Swamplandia. Do you see what she did there? The very quiet leap from the silent meditation of longing for departure to the dramatic scene of birds rising and a boat rushing among islands. For me, these poems are at their strongest when she uses her environment as the A in an ongoing Q & A with themselves. While I found poems to relish throughout the book, I think my favorites are in part V, which were written at Stone Quarry Hill Art Park in Cazenovia, New York. Maybe being a Pennsylvanian drew me to these poems as they describe scenery very like my own home. In the first poem in that section, Sagan uses, with dramatic effect, the refrain “body of” in a chant-like list of things you might find in any eastern woodland. That’s fun, as are a lot of the poems in this book. You can feel the author’s delight coming off the page. At the same time, there are also haunting moments, such as in “Tree House,” where the speaker reflects in attendant language (“The creaks and meows of night,/Shadows of the copper beeches.”) on the material landscape of a childhood while simultaneously acknowledging the psychological landscape. News of you in a long time. You can buy Seven Places in America here on Amazon. Remember earlier this week when a columnist for the Washington Post Online said stupid things about poetry, and the poetry world reacted with fire and pitchforks? Well here she sorta kinda takes it back. End of story. Now we can get back to fussing with our line breaks and other world-changing stuff. Who Put the Washington Post in Charge of Poetry? 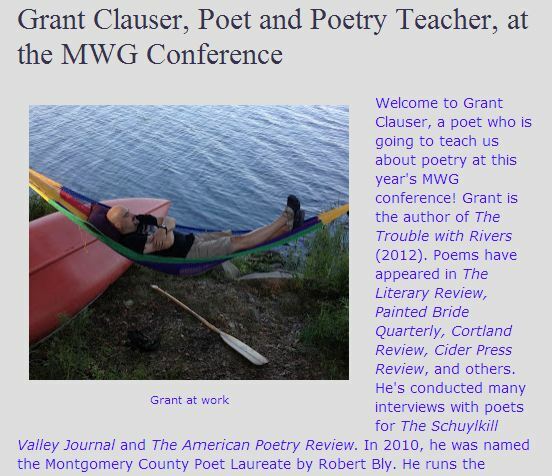 Today the Washington Post published an article by Alexandra Petri that asked, Is Poetry Dead? The article was a response to Richard Blanco’s poem at President Obama’s 2nd inauguration. I get that Petri didn’t like the poem. So what? But what bothers me more is she somehow decided that she’d been granted the power to decide what poetry is supposed to be, supposed to do, for everyone else. It’s a stupid and ill-argued article, but it’s also a reflection of what so many narrow-minded people probably believe about poetry. The article makes ridiculous and incorrect assumptions, but my guess is it’s not that far off from what a lot of people were thinking while Blanco recited his poem. Why is that? Why does Petri insist that poetry needs to change something? Does Petri even read any contemporary poetry (I doubt it)? Does Petri understand the enormous variety of poetry flourishing in the US right now? Possibly even more important–how has an attitude like that spread? Has poetry moved away from popular society or has society moved away from poetry? Was poetry dumped by its girlfriend or the other way around? But wait, there’s more. John Deming wrote an open letter response on Coldfront. You have to read it. These two videos were recorded at a Mad Poets’ Society event in Media PA in 2012. More about Harry Humes here.